Allegiance to Macron is largely negative! Alain Badiou interviewed about the Gilets Jaunes, Macron and future of the French left. The Dissident: Your latest book, L’Immanences des vérités (Fayard, 2018) is a philosophical saga of incredible density! Alain Badiou: It completes a cycle begun in the early 1980s. The first book, Theory of the Subject, appeared in 1982. It was still involved in the politics of that time, but it was a new philosophical turn. Then there was the trilogy: Being and Event (1988), Logic of Worlds (2006) and, finally, L’Immanences des vérités, which completes a sequence spanning some forty years. There are dramatized interludes, references to Spinoza and Plato, mathematical theories, whole numbers... Can we speak in this respect of a multidisciplinary work? I would perhaps not use that word. Philosophy has always been involved with everything. From the very beginning, it spoke of theatre, politics, science... It is necessary to distinguish my different activities – I am a political activist, a novelist and a dramatist – from the way in which philosophy makes use of this ensemble, which it considers natural material for reflection. I am versatile and seek to bring these disciplines together in the field of philosophy. Who is this ‘philosopher Ahmed’, a kind of banlieue Scapin who appears in your trilogy? His origin can be found in 1984 in your play Ahmed le Subtil. I gave a philosophy seminar at the Théâtre de la Commune in Aubervilliers. Because I wanted for philosophical reasons to refer to theatre, this character had to be present, and not only by way of quotations. Working on a stage, I called on my friend the director and actor Didier Galas, who took the role of Ahmed. He played mini-pieces. In philosophy, we are led to give many examples from everyday life, history or art. This allowed me to embody the example by showing it instead of quoting it. In your new book, the chapter ‘A poetic process of modern finitude’ analyses René Char, in particular his poem ‘La bibliothèque est en feu’. How does his work inspire you? One of René Char's greatest achievements was to have managed to ‘poetize’ his own political commitment. He is one of the great poets of the Resistance. He was a member of the armed resistance during the Second World War, under the pseudonym ‘Captain Alexander’. Coming from surrealism, he was able to make poetry out of this. He has always impressed me greatly by the strength with which he translated into poetic language some elements of his historical and militant experience. That is why he is important to me. Theatre and poetry are not directly controlled by philosophy. They have been with me in an anarchic and existential way since my youth. Shlomo Sand wrote in The End of the French Intellectual (Verso, 2018) of a certain collapse of French thought. As the most widely read French philosopher in the world, what do you think of this? This verdict on French philosophy in the recent period is actually more political than intellectual. In the past, and especially in the post-war period, the French intellectual was represented as ‘committed’. This is a figure that was invented in France. This country has been a cauldron of radical political stances on the part of writers. In Sartre’s case, on the Communist side, but also before the war on the far right: Robert Brasillach, Louis-Ferdinand Céline... From the 1980s onwards, a large group of French philosophers joined the reactionary and conservative camp. When foreigners say that there is a collapse of French intellectuality, I agree with them. They did not need what the ‘new philosophers’ represented – who were neither really new nor philosophers. Other countries already have their own conservatives. They are not interested in having our neoliberals. Fortunately, there are still exceptions. I can award myself this title! You also have ‘followers’, like Alberto Toscano. This has always been the case with a committed philosopher. I was myself one of Sartre’s disciples. He is someone who speaks to everyone and leaves a strong mark. This was already the case with Socrates. ‘Disciple’ is a somewhat worrying philosophical notion, since many of them are future betrayers. How did you split with Sartre? I never really broke with Sartre. In the last texts I wrote about him, at the time of his death in 1980 and afterwards, I always recognized his greatness. I separated from him philosophically quite early, at the end of the 1950s, when I encountered structuralism, the new works of Michel Foucault, Louis Althusser, Gilles Deleuze, Jacques Lacan... I could no longer function in phenomenology or existentialism. But since Sartre remained faithful to his political commitments, I remained close to him from this point of view. I didn’t have to criticize him violently. It was more of a steady distancing process. This led me to writings that are undoubtedly very contrary to those of Sartre. Your first political beginnings were in the context of the Algerian war? People of my generation all began their political commitment by taking positions on colonial conflicts. First the Algerian war and then the Vietnam war played a decisive role in mobilizing a series of young intellectuals. I was close to Sartre precisely on the question of the Algerian war. He was very radically involved. This situation was extremely brutal. You can see other illustrations of this today across the world. But in this particular case it was very close to home. We should not forget that one million young Frenchmen had to go and fight in Algeria. There were very violent attacks. Torture was used. At the age of nineteen, I took part in the first demonstrations against the Algerian war, which were far from calm. The police beat us with truncheons and so on. Especially since at that time we were not well organized. We didn’t know yet that you had to have a solid bloc at the front of the demonstration. We went rather like sheep to the slaughter. It was also an experience of the violence that the world is capable of when serious interests are at stake. This forged my conviction that any real political position carries with it a portion of antagonism. We must accept being at odds with the dominant world, even if this is not an obligation. I do not consider as true philosophers those who flatter the established order. In your opinion, is the racism and colonialism of that time still rooted in people’s minds? All my experience shows this! When you see how quickly anti-Arab, anti-Muslim, anti-foreigner stereotypes can reappear, there is a colonial impregnation that goes back a long way and is still very strong. It remains in the collective unconscious. It takes the form of a certainty, incredible to me, that our world is superior to any other. It is clear that the West, i.e. the last expansionist powers, considers itself – and is considered by the majority of its population – as the panacea of modern civilization. In reality, it is an imperialist and unequal construction, creating irreparable disparities. There is a blind violence in equating the ne plus ultra of civilization with something that in certain respects is monstrous. In 2005, you published an article in Le Monde denouncing the fate of ‘minorities’ in France. This followed the arrest of your adopted son of Congolese origin. The official statistics are there. If you are black or Arab, you are twenty times more likely to be arrested on the street than if you are white. There is de facto segregation in our society between ‘respectable citizens’ and those deemed not to be so. Simply having a foreign appearance is enough. This pervades our entire society in an intolerable way. When Mouloud Achour's ‘Le Gros Journal’ was broadcast, you met Assa Traoré. She and the Adama committee have denounced police violence, following the death of her brother in a Persan-Beaumont police station in 2016. Is it possible to link the working-class neighbourhoods and the privileged classes of which you are a part? I think it’s quite possible. It’s a matter of will. I worked for years in a fraternal way with African workers who lived in Adoma homes, with their own rules... and their own misery. I have had no difficulty with this population, who often know me a little bit through television. In my political struggles, the people whom I have fraternized with belong to the intellectual fraction of young people mobilized on these issues or to this disadvantaged fringe itself. This is where I have friends and comrades in action. My enemies, those who constantly run me down, are rather well-established people. In your book On a raison de se révolter (Fayard, 2018), you describe how in May 68, you had a foundational experience, meeting the workers of the Chausson factory in Reims, where you were teaching at the time. At the level of sensibility, that was my main experience of May 68. From that moment on, I realized that two worlds – which I had imagined as separate – could go beyond this paradigm. While being a Marxist and recognizing the importance of the working-class world, it was very far in terms of existence from the philosophy teacher that I was then in Reims. In 1968, I realized that teachers could, as we did, march to the Chausson factory. Little by little, we were accepted. The youngest workers came to talk to us. Then we went on to hold exciting meetings in the city between intellectuals, students and workers. With the support of activists and students. A solidarity fund was set up in the factory. The class barrier did not prevent us from building a political and fraternal project. It was a defining moment in my life, and I remained true to what happened during that sequence. Later on, you taught at the University of Paris-Vincennes, which was a pioneer in terms of ideas. It was a very special university, a field of experimentation from its early years, 1969-71, until the 1980s. All political groups were represented there. The lectures themselves turned into meetings. Buildings would be occupied on a simple vote. There were fights with the police. We would send delegations to the factories. We would talk to teachers in the banlieues. For a while it was a hotbed of militancy. Later there was a reassertion of control and ‘stabilization’. The intellectual experience was extraordinary because Gilles Deleuze, Michel Serres, François Châtelet and Michel Foucault all taught there. It was, on the university side, what I had experienced in the factory in Reims. There was a circulation between the two. When we see Parcoursup and the dismantling of a certain idea of the university open to all, can we draw from this kind of experience? It would be very nice to refer to it. But unfortunately, the situation is no longer the same. Today, this type of practice is increasingly difficult to implement. Two factors have been at work, with the result that from the 1980s there has been a long, tremendously reactionary and counter-revolutionary sequence that changed the situation. First of all, this had an ideological character: after the counter-offensive personified by the new philosophers and liberals of all kinds, this reactionary thinking became hegemonic on a large scale. Then there was a relentless deindustrialization of France. I would point out that none of those factories where I interacted with the workers are still there today: Chausson in Reims and Gennevilliers, Rhône-Poulenc in Vitry-sur-Seine, Renault in Boulogne-Billancourt... We had built up a real working-class nucleus there. For years, I worked with these people very closely and intensively. There was no political backtracking there. But these places have purely and simply disappeared. This industrial periphery of the large cities has been destroyed. And, finally, the country is no longer quite the same. The ‘possible political landscape’ has changed. Currently, the dominant issue is that of major population movements. A nomadic proletariat has developed, coming from Africa, the Middle East and Asia. It is with this proletariat that we must try to renew political ties. Today, it is impossible to consider any major political problem except on the world scale. The consequences to be drawn from an organizational point of view are another matter... If you do not focus on this level, you cannot understand the situation. It is not completely wrong to say that there are no more manual workers in France. At the world level, on the other hand, there have never been so many workers as there are now. Simply that they are all in China, Bangladesh, Cambodia, Brazil or Romania. We seriously misinterpret the political and social situation, in the broadest sense, by seeing it only through the French keyhole. Forty years ago, in this country, there was a complete social fabric, with peasants and workers in large factories. The changes of globalized capitalism force us to change our thinking accordingly. If you don’t have the same measure as your opponent, you’re bound to fail! Today’s proletariat is a vast nomadic proletariat seen as immigration or migrants. In reality, this is a question of class relations at the planetary level. This implies, at a minimum, prioritizing international relations and having a position on this nomadic proletariat that arrives in our country or wants to settle there. I like these divisive questions! Those on which there’s a consensus are rarely the right ones. This is the major political issue that divides, in a confusing way. Positions on the left are unclear. After all, what would an organization of the nomadic proletariat mean? We are far from having solved this problem. But you have to raise it. The strategic political stage is global. On this point, capitalism is a good step ahead because it is comfortably established on this stage. May 68 retains this virtue of not being completely ‘digestible’ by the authorities. Nicolas Sarkozy, who was always more sincere than other people, said: ‘We must put an end to May 68!’ This had the merit of being clear. And it meant that, for him, 1968 was still there and had not been sufficiently liquidated. It remains a negative symbol for reactionaries for two main reasons. On the one hand, it was an exceptional radical experience with, in particular, the effective link between intellectuals and workers that is very dangerous for the established order. And, on the other hand, there was a change in morals, sexual liberation, a way of living that challenged the general family and social conservatism of the ‘grumpy reactionaries’. It can’t be taken away. This is what makes it a divisive event. In Petrograd Shanghai, les révolutions du XXe siècle, you support the Chinese Cultural Revolution, including its hundreds of thousands of deaths. Aren’t you the last person who still sees this as an inspiration? In the 1970s – quite a time ago, but after all, we still talk about the French Revolution and the Paris Commune – many intellectuals supported the Cultural Revolution. The reasons for their ‘repentance’ should be carefully examined. Everyone read the weekly Peking Review. It is wrong to believe that the horrors of the Cultural Revolution were gradually discovered. Everyone knew that there was great violence, the Red Guards, workers’ detachments... Entire Maoist groups, such as the Gauche Prolétarienne, even tried to imitate this violence. Their political line, in my opinion completely wrong, was also to put dunce’s hats on foremen, attack bosses physically and undress them... The Cultural Revolution was a revolutionary paradigm for all those who supported it. Then they became renegades of what they had been. 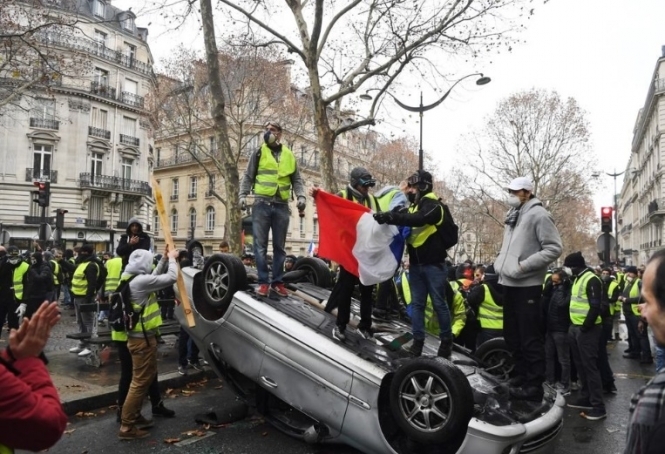 This Revolution served them as a foil, talking about it like the ‘incroyables’ at the end of the French Revolution: bloody orgies, atrocities everywhere... Revolutions have always been discredited by being seen as times of deadly chaos. I remain faithful to what the Cultural Revolution was in its political content. I am fully aware that it failed. Some of its violence was unnecessary and excessive. Episodes of this kind exist in all revolutions. The French Revolution had its period of anarchic terror. The September massacres were horrific. I believe I am making a calm and balanced judgment on the Cultural Revolution, compared to the bitter supporters of its historical destruction. They see it as an atrocious episode, from which simply nothing can be learned. On the contrary, it was a fundamental political sequence. It was the first attempt in history to change a Communist regime from within, not by repression and purges, but by the liberation of a mass student movement, first of all, and then one of the workers. Like May 68. The Cultural Revolution began two years before this. In a sense, I maintain the meaning and value it had for everyone at the time. You’ve stated that the violence of the Chinese Cultural Revolution was less than that of the capitalist order since its advent. When we talk about violence, we must keep two criteria in mind. First, that violence is rarely good and should be avoided. That’s a moral judgment, which I accept. If objectives can be achieved without resort to violence, that’s much better. I’m definite that violence is not something I’m happy about. The second aspect is that violence is sometimes inevitable when you are dealing with a conflictual matter. Your opponents do not hesitate to use violence when they feel desperate. So you have to be prepared for it. My doctrine is that legitimate violence is generally defensive. In other words, it seeks to protect gains or orientations made. In the world as it is, it seems impossible to me to be systematically against violence. Your relationship to the Chinese Cultural Revolution brought admonitions from your fellow philosopher Daniel Bensaïd, whom you paid tribute to at the Mutualité in 2010. I always had a good relationship with Bensaïd. He criticized me, including my philosophy. He said I was a ‘miracle theorist’. I had a lot of respect and friendship for him. He was the best thing to come out of Trotskyism. You boycott elections. How do you respond to those who say that with the retreat to identity that brought Donald Trump and Jaïr Bolsonaro to power, the far right can triumph here in 2022. The electoral process has always been a godsend for the far right. We need to question it. Even Hitler took power in 1933 following regular elections. We have never seen communists win national elections. It does not seem that the ballot boxes allow radical revolutionary communist movements of the far left to really come to power. In 1981, there was a fiction of such a state of affairs with the election of François Mitterrand. After two years, we realized that it was a continuation of the previous order. On the other hand, the far right has come to power. And it will happen again! Why? Because this type of suffrage is not designed to change society. It is a consensual system, whose rules are accepted by everyone. If this is the case, it is because it is in accordance with the existing dominant order. I do not understand how people continue to think that elections are a free space in which the fundamental direction of a country can be determined. As former information minister Alain Peyrefitte rightly said when Mitterrand was elected: ‘Elections are about changing governments, not society.’ He told the truth, because this is a rule that everyone seems to have agreed. It means that the rulers of our society, who everyone knows are a small core of big capitalists, would not accept elections that do them harm. When things get a little too hot, when the risk is too great, they rally to the far right as their last line of defence. It is not extraordinary to say that elections are a consensual system in which the imperialist bourgeoisies thrive. I don’t think they’ve ever been used for anything else. In the United States, Donald Trump can be elected but never a communist. That is true everywhere. The parliamentary electoral system was invented by English imperialism and criticized by Rousseau in the eighteenth century. He explained very well why elections are not democracy. The great capitalist and imperialist powers built their fortunes on this. The sign that a power has reached a considerable degree of development and influence is marked by the fact that it adopts this system. I think the Chinese will say that an electoral system is better than the centralized system they have now. It enables them to accumulate capital very quickly. But sooner or later, the Chinese petty bourgeoisie will demand some satisfactions and freedoms. They will adopt elections because they have created ‘high-level capitalism’. So-called ‘revolutionary’ policy has nothing to do with elections. In certain circumstances, it may be interesting to stand in such competitions. But it is an obvious aberration to believe that this can lead to a ‘revolutionary’ policy. In 2015, in the ‘Contre-courant’ programme that Aude Lancelin hosted at the time on Médiapart, you discussed with Jorge Lago, head of international affairs for Podemos. What do you think of the sustainability of this movement? It is clear that they are entirely prisoners of the electoral game. The experience of Syriza should be enough. In Greece, this party has become the manager of capitalist imperatives. To the point that, today, the Tsipras government is imprisoning those who have remained active militants. Terrible things are happening in that country. They are locking up groups that are trying to oppose public housing being auctioned off. This has become the most profitable activity of Greek capitalism under European leadership. Podemos is not everywhere. The question is whether or not this party should form an electoral alliance with the socialists. It is an interesting movement of ideological unrest. But from a political point of view, Podemos remains a component of the dominant system. How do you explain the gap between Emmanuel Macron’s unpopularity and the esteem in which he is held by certain eminent intellectuals (Régis Debray, Edgar Morin...)? I analyse Macron as a by-product of the Bonapartist tradition in France. When the traditional party system is in peril, unbalanced, a singular figure appears who immediately establishes his own apparatus. He takes advantage of these circumstances to establish himself in power. Napoleon put an end to the internal quarrels between the personnel of the Revolution with a military coup d’état. Louis Napoleon, in turn, put an end to the ‘disorders’ of 1848. Faced with the impossibility of an agreement between monarchists and democrats, he settled the issue ‘from above’. This Bonapartist position was shared by General de Gaulle. You had to be for Macron or else – horror! – we’d have Marine Le Pen! Basically, in public opinion, Macron is a negation and not an adhesion. His policy is an adjustment to globalized capitalism. We have to privatize everything, put an end to social security. Do as in America. From our country’s point of view, it’s the ‘impossibility of anything else’. This what makes Macron both strong and weak. Given that he acts, we are obliged to judge him for his actions and not simply on the basis that there is nothing else. Since his measures are an endless series of rubbish, he confuses pensioners by his attacks on them, nurses in care homes, provincials because of the concentration on big cities, the gilets jaunes by the fuel tax... People realize that his fast-paced Americanization program in France will cost them dearly. Despite everything, there is still the negative side of his appeal, the idea that there is nothing else. A whole intellectual fauna says that we cannot have either Marine Le Pen or Jean-Luc Mélenchon, seen as the two extremes. This is very funny, because I don’t see anything very extreme about Mélenchon. In media language, there is a supposed connection between populism of the far left and populism of the far right. Ugo Palheta’s book La Possibilité du fascisme (La Découverte, 2018) argues that this amalgam actually benefits the far right. I find this talk about populism extremely strange. It’s a portmanteau word making the rounds, a negative label to stick on. Just because the establishment accuses someone of being populist does not tell me anything about who they are. It only tells me that they are not wanted in the dominant system. The term ‘populism’, as it is used, implies that if you care too much about people’s points of view, you have reactionary and unacceptable ideas. That’s a strange consideration. From below, it seems to me that those who describe what they call extremes as ‘populism’ are in a position of mistrust towards the people. While, at the same time, they appeal to the great popular sovereignty of our Republic. There is a semantic obscurity there. What exactly does that word mean? It is any opinions that displease the oligarchy. Why? Because they care what people say? Because they demand more ‘volunteering’ from the people? For me, populism is a hiding place for suspicious things. Marine Le Pen is described in the media as ‘populist’. What I see as reactionary and dangerous about Marine Le Pen is not that she is populist. That doesn’t mean anything! She is not populist but identitarian. Her software is Pétainist: work, family, fatherland. That’s quite different. The cult of identity in politics always hides fascism in one form or another, more or less religious or nationalist. It is always based on identities, but not the identity of the people. That isn’t an identity, it’s all the people. A people always contains a number of different identities. We should get rid of the word ‘populist’ and say exactly what we criticize this or that orientation for. Marine Le Pen appeals to an absolutely mysterious French identity. France is a country with an indefinable identity. On the other hand, let the far left talk about sovereignty and the interests of the people, why not? It’s its tradition. We can also say that Robespierre and Saint-Just were populists. Mélenchon is still less dangerous. Your lectures and those of Jacques Rancière are sold out. What third way do you see between capitalism and totalitarian, bureaucratic Stalinism? For thirty years we have been in a period of global counter-revolution. Not only is conservative power entirely subject to globalized capitalism, it wants to undo what has been previously achieved. At one time, the Communist Party was powerful and there were revolutionary and committed intellectuals. Macron is seeking offensively and systematically to defeat these conquests. He is not the only one in the world. In the United States, Donald Trump is trying to eradicate the few scattered progressive atoms that still survive. Under these conditions, the camp that wants to define another path must be lucid. The situation is unfavourable. I would even say that we are in a period of recommencement. The most basic axioms of Marxism have to be disseminated, re-examined and discussed again. We should establish schools to transmit these. Almost at the stage at which the unlucky Karl Marx was when he wrote the Communist Manifesto so forcefully, on 21 February 1848. At the time, the communist party he wrote about was represented almost exclusively by him and Friedrich Engels. Today, the priority is ideological and experimental: are there political issues where we can try new models that are in open conflict with the dominant order? In France, there’s the question of the nomadic proletariat. I do not say ‘migrant’ because that is not their identity. The conflict exists. Things are happening, anarchically, as is always the case with beginnings. Experiments must be linked to a careful, prolonged and systematic examination of Marxism, but also to the revolutionary attempts of the twentieth century as a whole. What really happened in Petrograd and Shanghai? What is the balance sheet? What formulation allows us to avoid the failures of these undertakings? It’s a huge work! We have to combine experimentation rooted in concrete situations with this vast collective examination of the general balance-sheet of socialism during the century and a half of its existence. We need to get down to this. Finally, do you have any other projects pending? I am going through a rather unclear period. I could say to myself, at 81, that I’m at retirement age. The only problem is that that’s not really my temperament. In terms of philosophical construction, my feeling is that I will not go beyond what I have achieved. My trilogy forms a complete set. I can do particular studies, for example on real numbers. But these are exercises in a very specific area. As an ageing man, I think about writing a biography – not personal, but political. There is an arc between France at the time of the Algerian war and the France of Macron. A lot has happened between the two that I can tell you in my own way: what was it like for me to enter politics during the colonial drama, at the end of the Fourth Republic? Then there was my involvement in the Parti Socialiste Unifié, May 68, the Maoist experiences... the current situation. People seem to be interested in that!